Have you ever eaten at a Morton's Steakhouse? 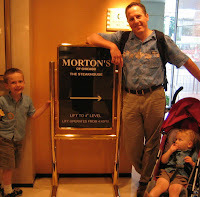 We ate there once as a family in Hong Kong (it's not a family restaurant, but it's not like we had a nanny) for Father's Day in 2005. I can still easily recall it being one of the most delicious meals I've ever tasted. It was certainly the most expensive! And even though Benjamin wasn't quite two years old at the time, it apparently left an impression on him, too. 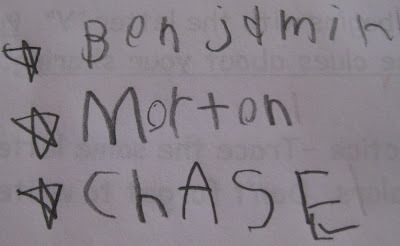 Now age five, he's started writing his full name on all his papers, spelling it Benjamin Morton Chase. I barely have the heart to correct him and tell him that his middle name is actually spelled Martin, named for my father and brother. He's just so proud of the fact that he sounded it out and figured out how to spell it all on his own!